I met up with Peter two days before the event to choose a deck. I tried to design something new, but lacked the motivation to get a real deck out. I thought about reusing one of my old decks (either Kazon, TNG Fed or Bajorans) but having failed miserably with Bajorans at German Nationals I lost faith in them. Peter had an almost finished KCA Klingon + T'Ong deck and as I played both in the past and it's a deck I enjoy plying I opted to use it with some modifications. For day 2 I once again considered bringing either Kazon or Borg but could not bring myself to prepare the deck in the morning after a very tough Friday night. So I only altered some things - like taking out the battle stuff which I only wanted in for the mirror quadrant matchups I expected on day 1 - and rolled with it. Played Mirror Klingons and T'Ong drop before, just not the combination. Although the only mirror things are actually just about getting the Regency and PO:Mining going. I love playing Klingons as they are really flexible. I don't recall learning something. Day 1 I added Jadzia to avoid the Strength-Denial combo which was used by Julius at his last Regional. I also added some battle stuff for Day 1 to compete in the Mirror quadrant. For day 2 I tried to figure out how to beat Steve's Delta deck and I had no really good ideas. But I got in a Computer Crash since Delta very often just relies on Kes/Anastasia if something goes wrong. It won me the game against Steve, blocking both a smoke bomb and a Mission Debriefing download, thus giving me basically two more turns. Since the game is based on the T'Ong it should be that one. Computer Crash and Whale Probes won me games on day 2. Sadly, QI once again decided two of my day 1 games in a a big way - it was in my favor once again but winning two continentals in a row on the back of QI rolls feels pretty dirty. Not about the deck, but the tournament and the venue were absolutely great. Big cheers to Julius, Steve and Alex for looking after us! Well now, this is a treat. Often I find that these articles write themselves. I go straight to the play engines, see what type of deck is being used, then look for interesting individual touches in the rest of the cards. Sure, I could be looking at a standard TNG solver, but that Quinn in the draw deck speaks volumes about what decks the player expected to face, and it isn't a card you see every day. Then we have a deck like this one. I see the Reshape/Regent's Flagship and, well, I've seen a few of those decks before. I know that they have great draw power, a fantastic seedable ship, and some quality personnel to back it up - except they are notoriously weak against Quantum Incursions. I thought it was interesting that a strong player would make the choice to play a QI-weak faction, so I looked at the non-aligned personnel next and saw Kes. I figured that she's one of the best Empathy personnel in the game, and worth breaking Reshape for in case of QI. That's when I noticed that all the other Non Aligned personnel in the deck would also break Reshape, and that I had something truly unique in front of me. T'Ong drops with New Arrivals! Space-Time Portal drops with the I.K.C. Chang and Kronos One! Combining both of those Report with crew effects is brilliant. Recurring the T'Ong too often gets awkward since most cards that remove it from play eat up your card advantage; STP is probably the best way to do it any provides its own ship drop synergy. Just like in my recent review of Paddy Tye's Starfleet deck, I'm excited to see a bunch of personnel that don't show up too often. David Marcus may see a revival once people start trying out Protect the Timeline with Camp Khitomer, but Klingon B'Elanna is about as homeless as a personnel gets. Alpha quadrant with a Voyager property logo and no High Council in lore? Good thing the T'Ong needed a chief engineer. Just be careful, it has a habit of repeatedly returning to hand. Oh, one more thing. I love these "rainbow" decks, but Stefan does get 5 demerits for Dr. McCoy. I briefly considered playing a klingon kill deck, but decided against it. Even with all the anti-voyager dilemma piles in the pool, voyager are still better at their missions than the Klingons. Quite frankly, the current competitive meta doesn't have any decks that I enjoy playing against. I didn't mind mirror matches (because the battle elements will usually give me an edge). But the only deck I truly enjoyed playing against were Sascha Kiefer's old-school klingons. I'm sick and tired of playing against phase 2 decks, they have almost completely pushed everything else out of the meta. There's lots of power creep, being rationalized by tying the cards to specific factions. It was refreshing to face one old-fashioned high level deck in between. Also, I've finally realized another part of what makes the latest decks so unfun to play against. 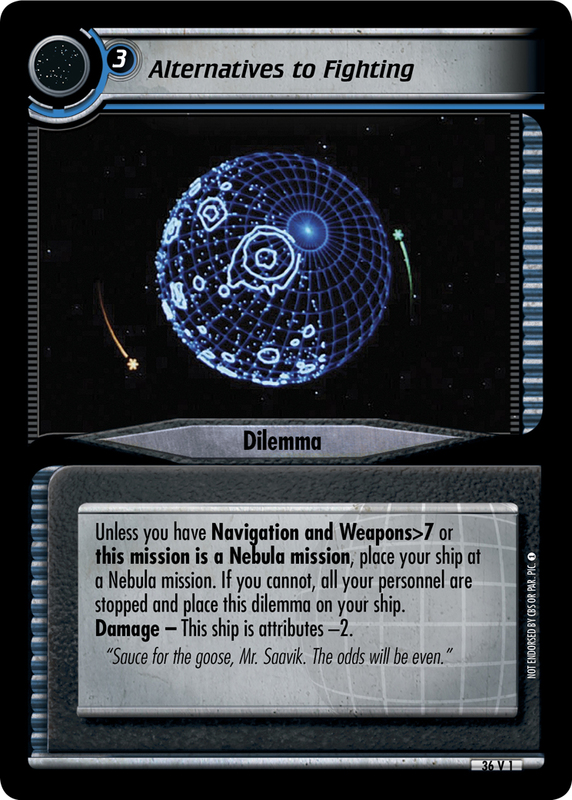 Previously, design has always been using "soft rule" cards to push deck builders into one specific direction (use missions with higher attribute requirements and varying skill requirements, use 40+ missions, attempt with 6+ personnel, go planet first, use dilemmas with skill requirements), and you could always follow those "rules" or take the punishment. These new decks have similar effects but they are pushing contradictory "rules" (at least for the dilemma pile). Voyager makes planet dilemmas obsolete, while most other factions will do only one easy space mission and spend most of their time at planets, and last year's Stakoron Strait missions punish dual dilemmas severely. This part of the meta feels a lot like rock-paper-scissors. On day 1 I had two timed losses (both were P+S vs 95 points). In both of these games I played Self-Replicating Roadblock on Distress Call (which was stupid because walls can be countered by Bridge Officer's Test or Homeward Bound). I'd probably have won both games had I played SRR on my final mission naming Timescape instead. Bridge Officer's Test was finally doing some work. Genetronic Treatment was intended to push me through kill piles, but there weren't any around. Probably still Homeward Bound; although Alternatives to Fighting has definitely earned honorable mentions. I'm hoping that we'll get some errata soon (people need time to prepare for worlds! ), although I'm also selfishly hoping that the errata will not completely destroy the deck.